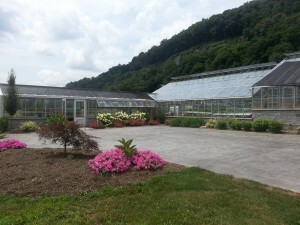 The Sandyvale Greenhouse was donated to Sandyvale by the Greater Johnstown Career & Technology Center. It was reconstructed at Sandyvale with the help of funding through the Community Foundation for the Alleghenies Community Initiatives Fund, a Keep American Beautiful/Lowes grant and Lee Initiatives grant. A surrounding patio, donated by Danchanko Inc. and in part by Fi-Hoff Concrete products, provides a beautiful wrap-around venue for outdoor events. With landscaping provided by Heather Hay through a grant from Men of Copenhagen Lend a Hand “Natural Disaster Area Re-build”. This spring the fully working greenhouse will again provide vegetable plants for the Johnstown Schoolyard Gardens and the neighborhood community gardens within the City. In addition, leafy vegetables and herbs will be grown in the hydroponic system, and tomatoes, vining vegetables and flowers will also be produced through a poly bag growing system, harvested throughout the summer and distributed to the Greater Prospect Co-op Store and local soup kitchens. Seminars are offered to the public at the greenhouse on Saturdays in the Spring beginning in March and running until April. For more information or to register, click on the seminars listed on the right of this website. We specialize in Beautiful Red Canna plants. Will grow 4 feet to six feet tall. Stately, showy plants are easy to grow in full sun or partial shade. Just plant and watch them grow. Impressive when planted in groupings. Beautify your landscape, business, garden or home with these beautiful ornamental flowers. Our most popular giant Canna stems produce flaming red blooms from early summer until frost. Lush giant green leaves add an exotic, tropical look to your entrance or landscape. Most impressive when planted in groupings of six bulbs or more. Bulbs will be shipped at the right time for planting in your zone and location and come with planting instructions. Plant in large containers for an impressive display anywhere you place them. 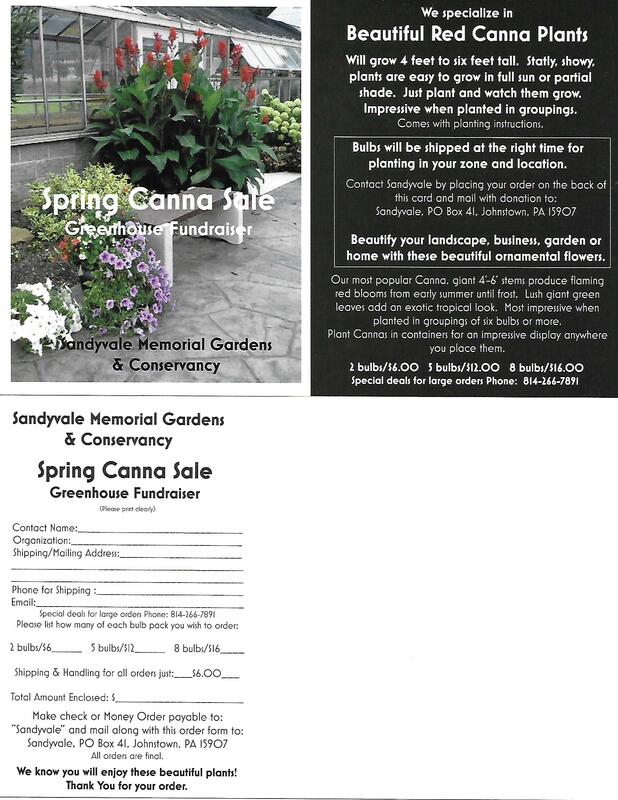 Place your order by filling out the order form and mail with check or money order to: Sandyvale, PO Box 41, Johnstown, PA 15907. 2 bulbs for $6.00, 5 bulbs for $12.00, or 8 bulbs for $16.00. Special deals for large orders phone: 814-266-7891. Shipping and details below. We know you will enjoy these beautiful plants!